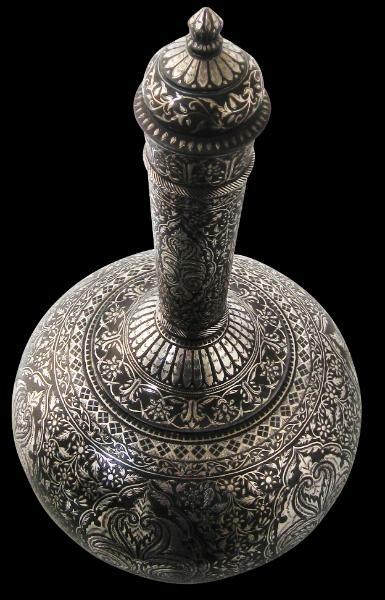 This water flask or surahi is in traditional northern Indian Islamic form, with a large bulbous body, a low ring-mat foot and a long tapering neck. It is also complete with a stopper. 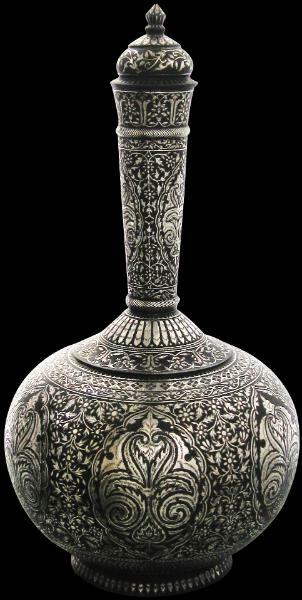 It is profusely and finely decorated with silver inlay using the bidri technique. The decoration is typically Islamic with scrolling foliage within geometric borders. The body has six large scalloped cartouches filled with palmette motifs, the silver of which has been further engraved to enhance the overall complexity of the decoration. The lid, the shoulder of the body and the base are all decorated with borders of lotus petals. The flask is unexpectedly heavy in the hand – it weighs almost 3 kilograms. 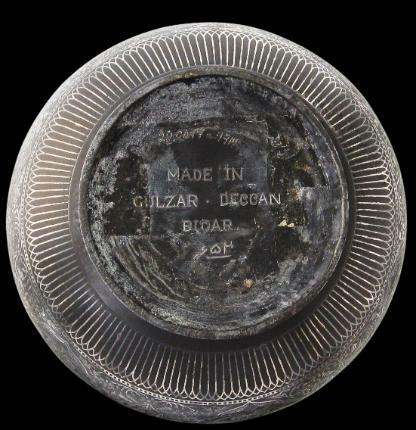 bidri, this piece has no losses to the silver inlay. 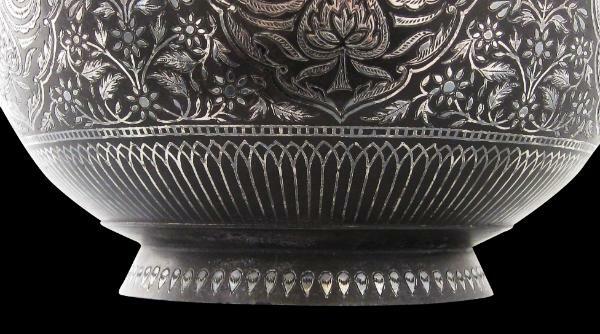 Bidriware is believed to have originated in the city of Bidar in the Deccan. It is cast from an alloy of mostly zinc with copper, tin and lead. The vessels are overlaid or inlaid with silver, brass and sometimes gold. A paste that contains sal ammoniac is then applied which turns the ally dark black but leaving the silver, brass and gold unaffected. Lal, K., Bidri Ware: National Museum Collection, National Museum New Delhi, 1990; and Stronge, S., Bidri Ware: Inlaid Metalwork from India, Victoria & Albert Museum, 1985.
to see another bidri surahi.